In this ever-connected world a real challenge has become to disconnect from the outside and reconnect within. Homeowners have taken on the task of nurturing their homes and creating luxury retreats that keep outside concerns at bay. Master bathrooms have evolved into home spas, personal sanctuaries to recharge and face the outside world. So what are a few qualities that make a bathroom the ultimate luxury retreat? 1) Space: In today’s overcrowded world, space is a luxury on its own. If your bathroom has space to spare, you’re already settled in the luxury bathroom category. Bathroom space is high currency these days. Why? Because we tend to borrow square footage from bathroom layouts and assign it to other living areas. If you find that your bathroom could benefit from square footage the best advice we can give is to start de cluttering. You’ve probably heard this more than once and rolled your eyes. Believe us, it’s sound advice. We’ve never seen an orderly space that looks small. 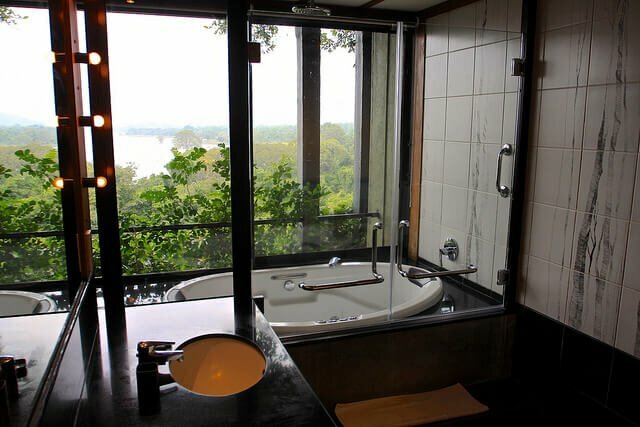 2) Lighting: The dream would be to have floor-to-ceiling windows and a tub with a view, like Tom Brady’s bathroom below. The truth is, boasting of abundant lighting in the bathroom is a luxury. If you can’t enjoy a glorious sunset from your bathroom, here are a few expert tips on how to improve bathroom lighting. If anything, install dimmer switches to recreate the atmosphere of your dreams. Who doesn’t welcome a warm glow? 3) Technology: When starting the transformation of your master bathroom into your own personal retreat, it may seem like you have to say bye-bye to technology in order to reconnect to yourself. 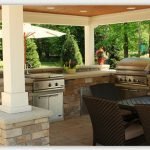 As crazy as it sounds, in the quest of transforming your master bathroom into your dream oasis, technology may very well be your new BFF. You may be in for a wild ride (a good one), if you haven’t kept up with remodeling updates. The hard part will come when you have to pick which of these technology advances are fit for you. Our favorites? Heated floors that will make your toes so grateful they won’t even know they jumped out of bed. Towel warming drawers can heat up your gear so you can wrap yourself in warm coziness. Anti fog mirrors so you can ask who’s the prettiest of them all. Bluetooth armed showerhead speakers that will play your favorite playlist. (Yes, to all!) The possibilities are endless when integrating technology into your dream bathroom. 4) Timeless Materials: Luxury is usually a synonym for quality. There’s no arguing that one. Applied to bathroom vocabulary, it means timeless materials: As in marble, granite, and natural stones. These materials are not just pretty. They are at the core of what we call classics, and if you haven’t heard, classics are here to stay. So choose wisely, and keep this little question in mind: how will this add value to my home? 5) Free Standing Tubs: Tubs have made a huge comeback in the luxury bathroom department. They’re the crown jewels of luxurious bathrooms. They have been updated with so many spa-like-features, you might end up thinking of them as a necessity, rather than a luxury piece. You can choose a hydrotherapy tub, that massages your concerns away, or an aromatherapy tub, that lets you pick your favorite scent for unwinding or energizing your mood. And, if you thought that this was too good to be true, get a tub heater. So you can sit in your perfectly warm bath for as long as you want, and find the fountain of wellness (youth is overrated, we’re striving for wellness now.) Seriously, for as long as you want. 6) Steam Showers: You might as well throw in a steam shower, since you’re already recreating the whole spa experience. Steam showers increase your overall wellbeing by ridding your body of toxins and improving your skin tone. So it’s not only about the amenities, but the skin glow you’ll boast about with your friends. 7) Personalize: Custom pieces made is luxury heaven. Why? Because they’re unique pieces and they’re valued as such. So get a piece you LOVE and transform it. From vintage vanities with sinks to a glamorous chandelier, own up to your space and leave your personal touch on it. 8) Lavish Accessories: If you find that bathroom renovation is a daunting task, start with the small things. Pick a towel so smooth you feel you won’t need moisturizer. Or a monogrammed bathrobe that makes you feel as if you’re in a five star resort. Wrap yourself in luxury.